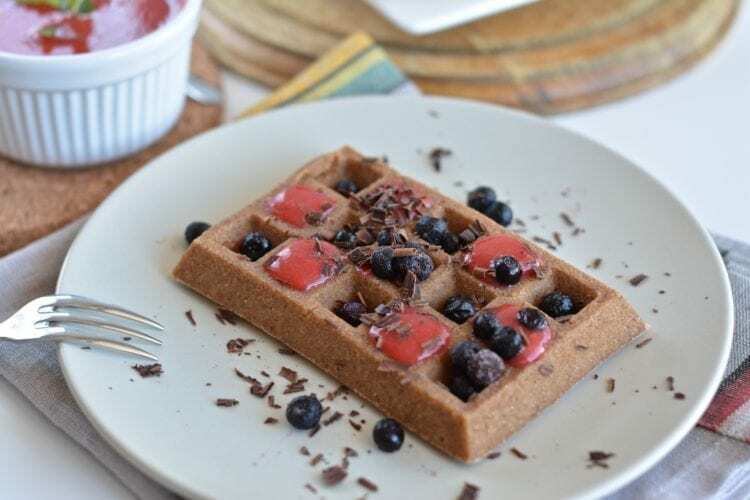 I was so happy to find silicone waffle forms, as it is quite time-consuming to make totally oil-free waffles with traditional waffle maker – you need to be very patient and playful in order to get the waffles off the pan decently. Those oven waffles are not very sweet, as I prefer only mildly sweet things. Should you be used to more sweetness, add a date or two to the recipe. Oven waffles make a perfect Sunday morning treat your family will long for. We have made it a tradition since I got the silicon forms and needless to say my hubby and kid are so happy about it. 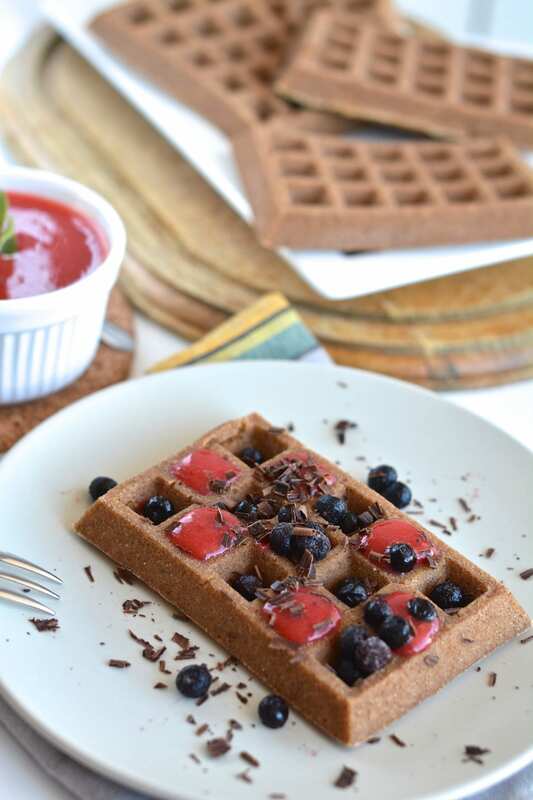 Those oven waffles are made of whole food plant-based ingredients using no oil or sugar. In a bowl mix together all dry ingredients. 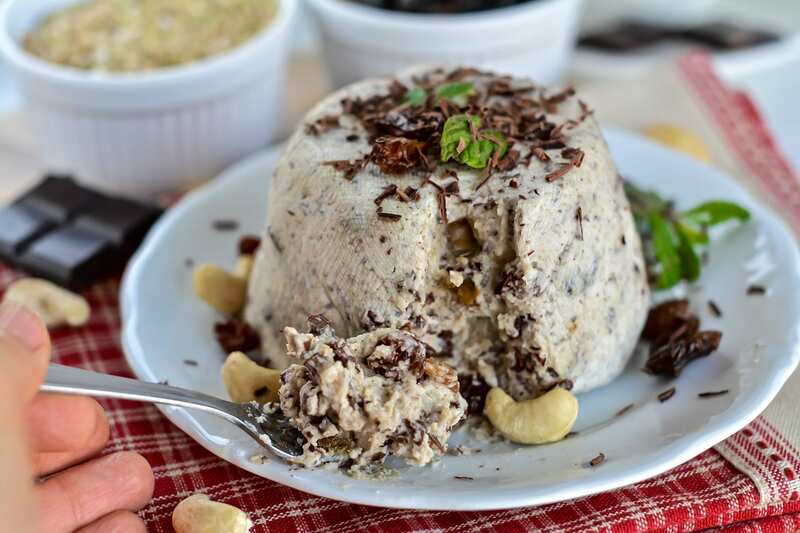 Put chopped dates into blender and add enough plant-based milk to cover the dates. Let soak for at least 15 minutes. Add banana, peanut butter and sea salt. Start blending. Add the rest of the milk gradually to avoid chunks. Pour the wet mixture on dry ingredients and mix well with a spoon. 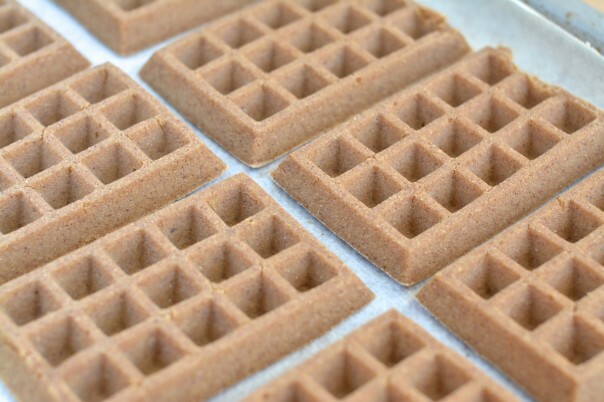 Place waffle forms on a baking sheet. Using ladle divide the dough evenly between silicon waffle forms. Heat oven to 220 C (425 F). 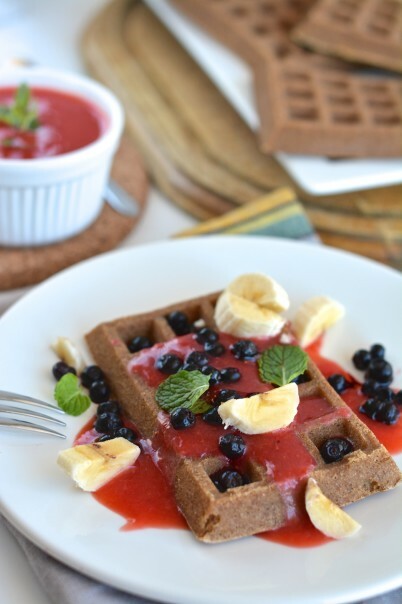 Bake waffles for about 20 minutes, until you see they are quite firm. Remove from oven and let cool for about 10 minutes. Line a baking sheet with parchment paper. Put the waffles upside down on the baking sheet and remove from silicone form. Bake the waffles for another 10 minutes until they start to turn golden. I’ve used grill mode for the last five minutes. We enjoyed the oven waffles with strawberry puree, banana slices, mint leaves, grated dark chocolate and blueberries. I am sure the waffles would also taste heavenly with mango puree and banana ice cream. If you are allergic to peanut butter, use any other nut butter. 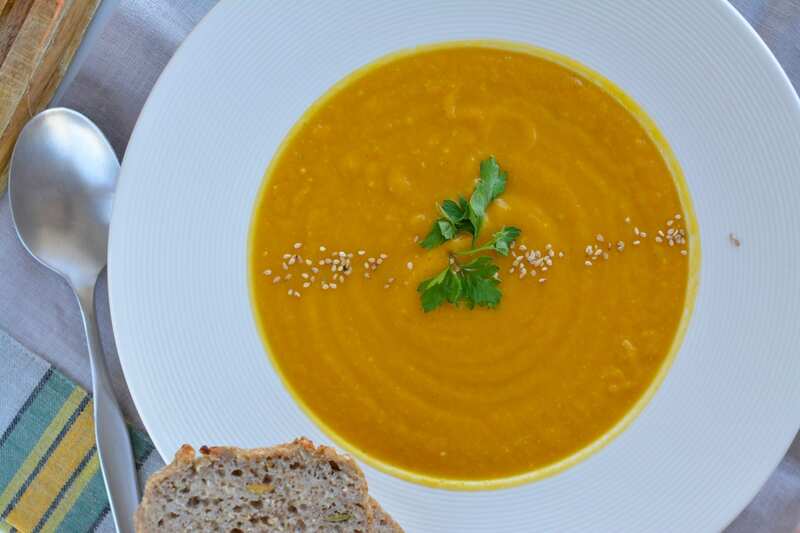 Make the recipe gluten-free by substituting spelt flour with oat flour. Add dates for extra sweetness. If you don’t have silicon waffle forms, pour the batter on two baking sheets lined with parchment paper. Bake for 25-30 minutes. Remove from oven and let cool before you start to separate them from the parchment paper. You’ll have sweet oven pancakes. The same batter can also be used to make hearty pancakes. I do just that with leftover batter that doesn’t fit into the silicone forms.